The price may be a bitter pill to swallow, but once you’ve played through this head for a few minutes it becomes remarkably sweeter. Tight articulation and snappy bass attack; exceptional tone from all three channels. The control panel lettering is hard to read; it’s expensive, but this is Mesa - you get what you pay for. Depending on your generation, Mesa Engineering means one of two things. It’s either the company that invented high gain in the early 1970s, in the shape of the small but outrageously versatile Mark Series Boogie amplifier, or the company that redefined the sound of modern rock and metal in the early 1990s with the all-powerful Dual Rectifier. With such a track record for genre-changing products, any new amp from Mesa is important. 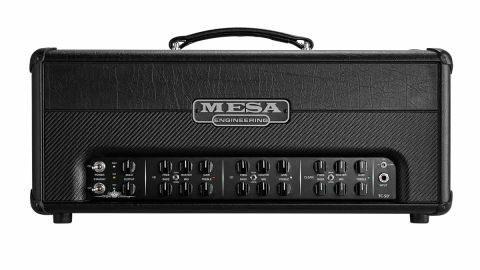 One of the world’s biggest users of the 6L6 output valve, Mesa has experimented with the EL34 before. Now, there’s an amp in the catalogue that might just alter rock guitar history for the third time and, again, it uses EL34 valves. Welcome to the all-new Triple Crown TC-50 head. Like all Mesa products, the Triple Crown is beautifully designed, with a fine degree of attention to detail. Mesa routinely takes what is essentially a boring black box and turns it into a thing of beauty. Check out the pleasing proportions, recessed die-cast badge and perfectly seated piping of this head cabinet, which is fabricated in Mesa’s own Petaluma cabinet shop using state-of-the-art CNC equipment. Inside the chassis, the electronics are mostly contained on one very high-quality double-sided printed circuit board. The layout is super clean and precise with some typically Mesa routing quirks, evolved over many thousands of hours of R&D. Wiring, soldering and chassis finish are impeccable, as you’d expect with Mesa’s pedigree. The Triple Crown’s clean channel is highly versatile, going from butter-sweet clarity to edgy blues soloing, with a lot of control over that ‘just on the edge’ sweet spot. The Triple Crown TC-50 is a three-channel amp, with independent preamps covering clean, low-gain and high-gain ranges. The front panel may look a little daunting at first, but is actually quite easy to navigate, with three identical sets of controls including gain, master volume, bass, mid, treble and presence, together with a two-way toggle switch that changes the channel gain and voice. There’s a small toggle switch for manual channel changing, and a pair of master output level controls, one of which is footswitchable. The feature-rich rear panel includes Mesa’s exceptional CabClone speaker-emulated output, with a balanced XLR, headphones socket and line out. There’s also a standard line out jack, plus ground lift and cab voicing toggle switches. The TC-50 also benefits from a footswitchable effects loop, separate reverb level controls for each channel, and MIDI switching for all the major functions. Die-hard 6L6 fans will be pleased to see that the TC-50 also has a bias switch to allow both output valve types to be used, as well as accepting 6V6s for a low-power option. The TC-50 powers up cleanly and smoothly with practically zero hum and hiss, a sure sign of a well-sorted circuit. The Triple Crown’s clean channel is highly versatile, going from butter-sweet clarity through to edgy blues soloing, with a lot of control over that ‘just on the edge’ sweet spot, making it easy to dial in any guitar for the perfect response. We love the drive option on this channel, which adds a subtle mid-boost together with a touch of compression, for a very touch-sensitive vocal solo tone that’s equally flattering for single coils and humbuckers. The Lo Gain channel is where the TC-50’s crunch and classic rock tones live. Here, we’re on familiar Mesa ground, with a multi-layered overdrive and harmonic overtones that shift with varying degrees of pick attack. Flipping the toggle switch into Drive mode adds a subtle midrange bump, invoking JCM800-approved snarl and a dose of extra gain. The Hi Gain channel adds more of the same - lots more, so much so that in the upper reaches we think this is probably the most gain ever from a Mesa amp, and pushed to excess it gets a little mushy. However, flip the channel into Tight mode and the articulation and focus return, with a devastatingly fast attack that’s perfect for chopped metal chord riffs. No doubt about it, the Triple Crown has three channels packed full of world-class tone that only a handful of amps can compete with. Add a superlative reverb, valve-buffered effects loop, MIDI switching and Mesa’s amazing CabClone circuit, and its lofty price tag becomes somewhat easier to justify. We set the bar higher for Mesa’s amps, because they promise so much, so it’s great to confirm that the Triple Crown delivers on all counts.